Katherine Scott/Pipe Dream Photographer Two Bearcats selected to the 2018 All-Conference First Team return as softball prepares for the upcoming season. 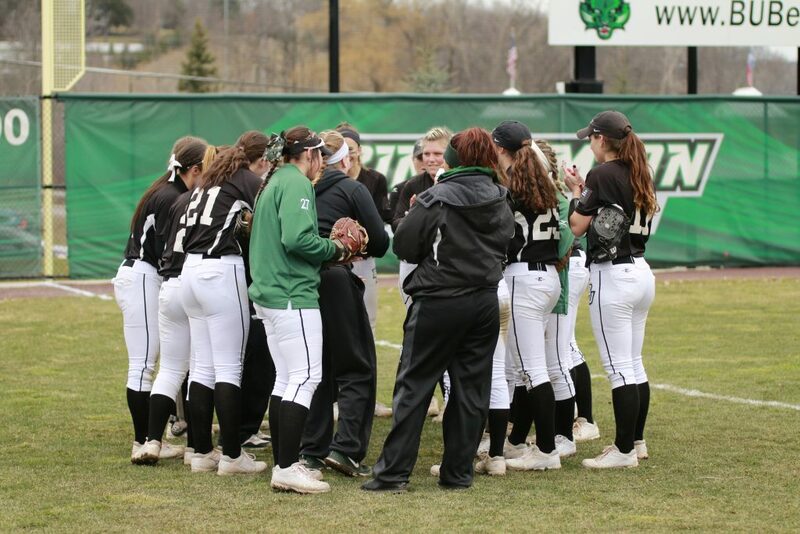 Since placing first in the conference and winning the regular season America East (AE) Championship for the second consecutive season in 2017, the Binghamton softball team chartered unfamiliar territory in relation to its successful program history, finishing at 9-9 in conference play last season. Two consecutive 1-2 performances in the AE Tournament, a lack of a consistent home field and the departure of outfielder Jessica Rutherford, ’18, have highlighted the event-filled seasons. Amid the inconsistency, a persistent message of staying together as a team resonated throughout the team’s media day on Monday. The Bearcats hosted the conference tournament last season, defeating Maine in the first round and falling to Albany and the Black Bears in the double-elimination bracket. Now with the departure of one of the team’s most productive hitters in Rutherford, BU boasts a roster that features depth in its pitching staff, youth in its outfield and speed at the top of its lineup. Binghamton’s pitching is headlined by Gibson and classmate junior pitcher Rozlyn Price, both of whom started on the team since they were freshmen. Gibson earned second-team all-conference honors two seasons ago and has led the team in wins in each of the past two years. Price enjoyed a breakout season last year, earning a first-team all-conference selection as designated player. Additionally, returning for the Bearcats are senior Makenzie Goluba and sophomore Chelsea Howard, and BU is bringing in a freshman pitching class of Morgan Bienkowski and Binghamton native Sophia Pappas. The top of the Bearcats’ lineup is expected to be bolstered by the speed of freshman outfielder Chloe Morgan and classmate infielder Marissa Braito, giving the team a new look at the beginning of its order. With Rutherford graduating, Morgan is expected to start in her place this season. After calling Ithaca and Chenango Valley High School home for most of its home games last season, all of Binghamton’s home games will be played in Vestal, a welcomed symbol of consistency for a team looking to rebound from a disappointing 2018 season. Binghamton will begin its season on the West Coast, participating in the CSU Northridge Early Bird Classic, playing five games from Feb. 15 to 17 and squaring off against CSU Northridge, CSU Bakersfield and Santa Clara University. The Bearcats open their season against Bakersfield at 3:30 p.m. EST from Matador Diamond in Northridge, California.